Brave Reece battled the lethal blood cancer for four years of his short life. He had a list of ambitions he was determined to fulfil before dying, including a ride in a Ferrari, spending a day at a fire station and holding a pirate-themed party for friends. ‘Marrying’ his long-time school sweetheart Elleanor Pursglove was his last dream. 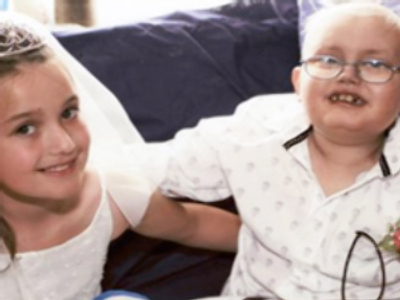 Reece proposed to Elleanor several times, and when doctors said he had only weeks left she answered ‘yes’. Originally the couple planned to have a vicar present to guide them through their vows, but Reece's condition was getting worse quickly and they settled on a simple ceremony at the ‘groom’s’ home. Reece was dressed in his favourite shirt while Elleanor was wearing a wedding dress. “You can't really describe in words what it was like. Reece and Elleanor were both very quiet, but there was a lot of feeling in the room,” said Reece’s mother Lorraine. Elleanor's mother Hannah was playing the role of vicar. The couple exchanged vows and rings and were even given a marriage certificate. The boy died the following day. “Elleanor is missing him a lot. They were both really pleased with the ceremony. It was very special – he just kept smiling at her,” the girl’s mother said.